Gimme all the salads you've got, summer! Because the less I have to turn on the stove and/or oven, the better life is. Even in LA, without all that east coast humidity, summer heat is still summer heat, and it can be pretty miserable to cook in. Hence, why salads and smoothies become my summer bff's. I usually whip up a salad for lunch, if not dinner, too, using whatever I have on hand, throwing in a little of this and a little of that. It always taste good, but every once in a while it tastes beyond good. I know this because I stop eating to write down everything I put in my salad, then I usually end up recreating it for dinner so Mr.RC can try it, and finally I proceed to actually go buy specific ingredients (versus using what is on hand) so I can make the salad 45676397 more times. 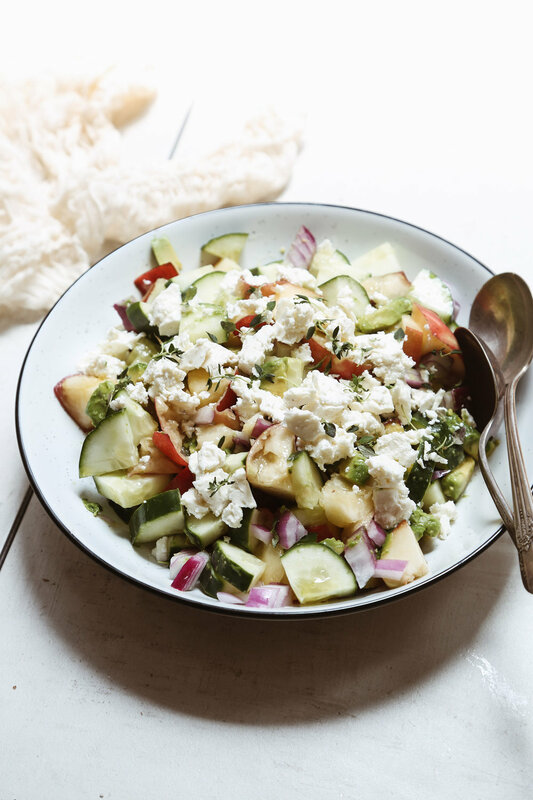 This nectarine, cucumber + feta salad is one such salad recipe. 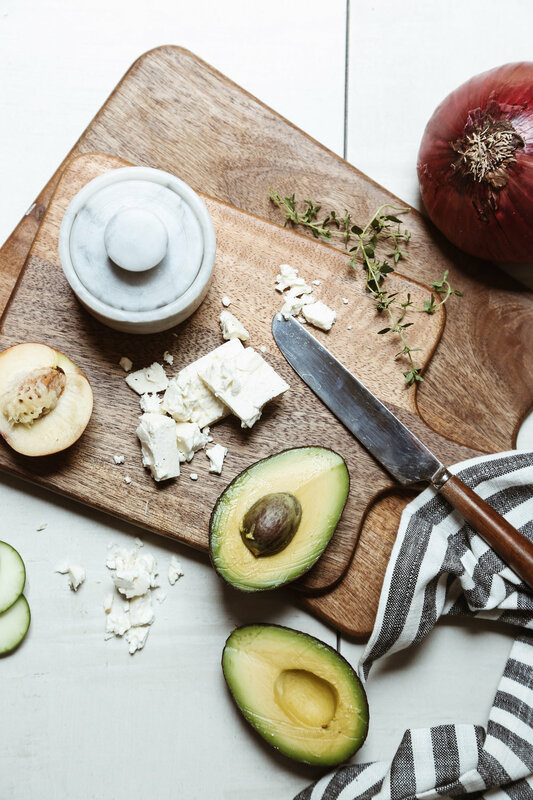 It was hot, I needed a quick lunch, and I saw I had a few things to use up, a half an avocado, a little feta cheese, an overly ripe nectarine on the verge of ending up in the trash can instead of my mouth. I sliced and diced, threw everything in a bowl and went to grab a magazine for my usual lunchtime routine of reading and eating. But one bite of the salad and I had completely forgotten all about my magazine. I mean, not to be all dramatic about some fruit, but it was just so good. I immediately texted the Mr. about my creation and that we had to "eat it again ASAP!!!!!" Which we did...again....and again....and, you guessed it, again. So I figured it was high time this salad that has become the star of our kitchen gets a little time to shine on the inter-web, too. 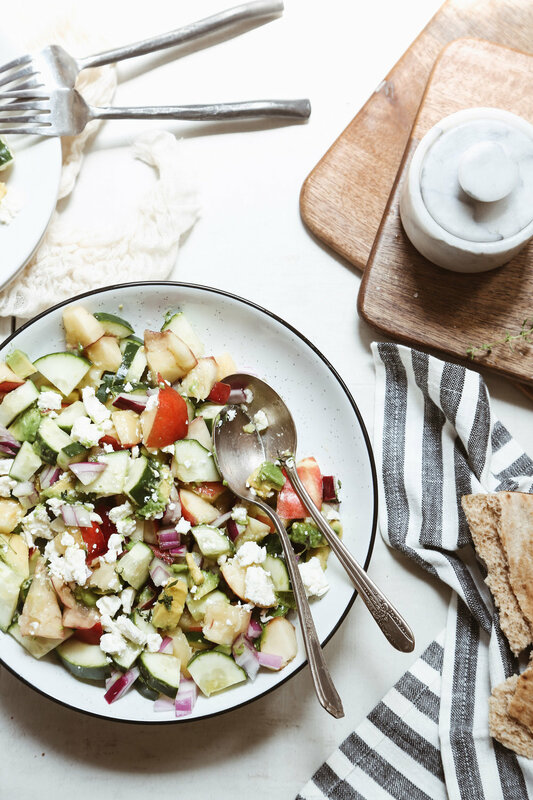 This salad is perfect for a quick, light meal, but tastes even better with a nice crusty bread and a crisp glass of rosé. To make it vegan, simply omit the cheese. 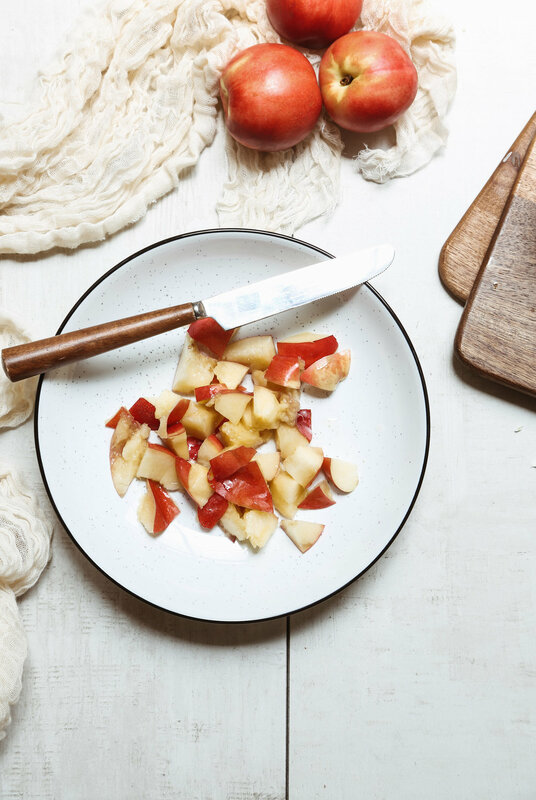 Don't like nectarines? Use peaches instead. Need something a bit heartier? Serve it with chicken or fish. This recipe is totally flexible and you really can't go wrong with it however you choose to enjoy it. (But for the record, I may or may not be impartial to enjoying it with a glass of rosé ;) #basic #predictable #sorrynotsorry). What are some of your favorite summer salads? 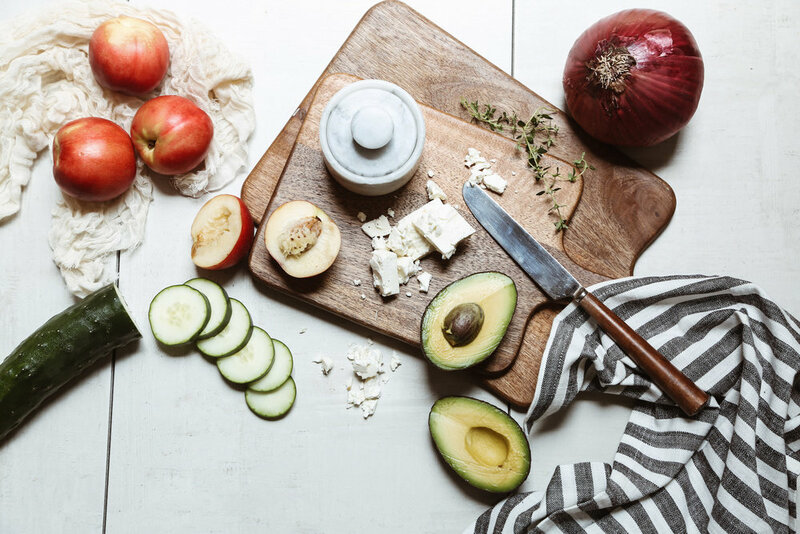 To a serving bowl add the nectarine, cucumber, avocado, onion and herb(s) of your choice. Drizzle with olive oil and lemon juice and sprinkle with salt and pepper, all to your taste preferences. Toss lightly to combine. Finish with feta cheese crumbles and additional seasonings as necessary. This is perfect for a light lunch all on its own, paired with a crusty bread or crackers, or some grilled fish, chicken or shrimp for a bit heartier of a meal.